Known for their smiling faces and frolicsome spirit, quokkas always put on a great photo shoot. But when Jeane and Bing snapped the photo below, they noticed this particular quokka was showing off a little something extra. 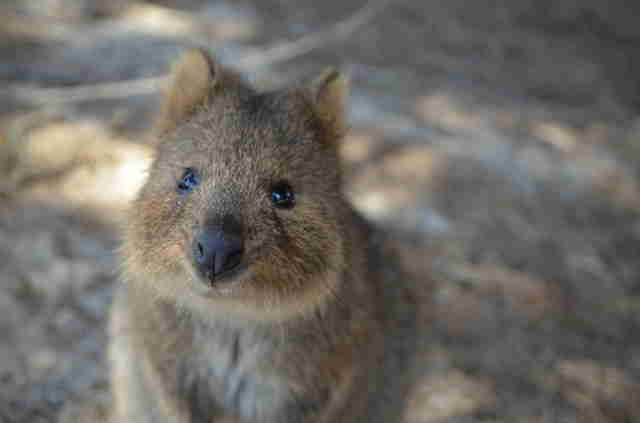 The photo was taken by Jeane and her husband Bing who traveled to Rottnest Island in Western Australia in order to photograph the happy-looking marsupials. "We were very pleasantly surprised to find quokkas to be extremely trusting, gentle and inquisitive, with seemingly permanent smiles on their faces!" Jeane wrote to wrote to Australian Geographic. "We reckon quokkas are underestimated and they deserve the worldwide recognition that other more well-known Australian marsupials enjoy (e.g. kangaroos and koalas)," she continued. Jeane probably didn't expect to bring mass attention to the quokka with her photo, but that's exactly what she did. Once the photo was featured as on Australian Geographic, it quickly became the publication's single most popular reader-submitted photo of 2015. Do you have something to share with The Dodo? Send your tips and photos to solon@thedodo.com.